Last week I was marveled and enchanted by the work of the people involved in America’s Next Top Model. Now I’m speechless and saddened. Maybe I’m taking things too far? You’ll tell me after a quick look at their latest photo shoot project. 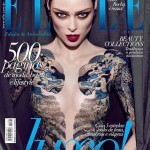 It involves a model I love dearly: Coco Rocha. And she’s doing a very interesting theme with the girls from ANTM. I can’t even wrap my head around it enough to give it a possible reason, let alone understand where this photo shoot with Coco Rocha is going and where it came from! In her quest for stardomness, is Tyra taking things a bit too far? Am I taking things too far? Coco Rocha Is In The Room! I just think you’re being a typical Tyra-hater like always. I don’t see what you have against a strong and successful black woman. Jacob I have never noticed anything of the kind you stated here. If that was the case I wouldn’t be around here ever. Where Tyra was being criticized for not being appropriately dressed as she ran between shoots for her show. I find it very interesting that the author of this blog deleted my comment which linked back to the other articles that were bashing Tyra. Wouldn’t delete it if it weren’t true. Jealous of Tyra much? She lives fashion and you’re just on the periphery looking in. Sad. The photos look so good! I can’t watch this episode on my DVR. Finally, Alexandria is looking good!